This is an easy and relatively quick recipe for a homemade white yeast bread without a bread machine. Because it's so easy, I recommend making it entirely by hand, but if you want, use your pastry hooks to get the dough started, and finish off by hand. This yeast bread recipe is quicker than most, and easy to make. Bread flour is best, but all-purpose flour produces a nice result as well (it's what was used to make the loaves in the photo). 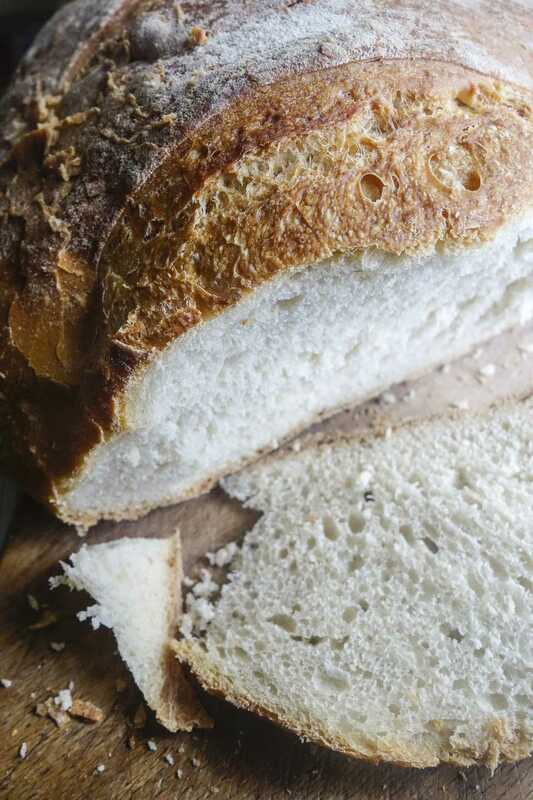 A great recipe for last-minute homemade bread. Dissolve yeast in the warm water. In a mixing bowl, combine 1 1/2 cups of flour, salt, oil, and yeast with water, and mix until thoroughly blended. Cover tightly (plastic wrap works well) and let sit for 30 minutes. There are two ways to make the dough: using a mixer, and by hand. Mixing with pastry hooks, slowly add 2 cups of flour to the yeast mixture and knead until smooth. The dough will be very sticky and just needs enough additional flour so it can be handled. Sprinkle a work surface with the remaining 1/4 cup of flour and turn out the dough, kneading briefly by hand, pulling in the flour, until it doesn't stick to hands. Add 1 1/2 cups of flour to the yeast mixture and combine with hands to form a cohesive dough. Turn out onto a floured work surface and knead in as much of the remaining flour as needed until the dough is smooth and doesn't stick to hands. Shape into two loaves, place on a nonstick cookie sheet, and place on the middle rack in a cold oven for 15 minutes. Turn on oven to 425°F (220°C) and bake on the middle rack for 30 minutes or until golden. The loaves will rise while in the cold oven, and will rise further when baking, so allow adequate space between. To create a more crusty top, just before baking score the loaves 2-3 times diagonally across the top. Optionally, just before baking, brush the top of the loaves with water and sprinkle with sesame seeds before placing in cold oven.